We are living in interesting times indeed. Geo-political revolutions, financial crises, economic uncertainty. Try as we might to ignore them, the fact is that the very fabric of capitalism is being re-evaluated, and perhaps even rewoven. What we have assumed and known for at least 150 years is at the very least being questioned. Institutions that have spanned generations are now vulnerable. Banks are still closing down weekly. The situation in Europe is increasingly fragile as previous whispers of dramatic austerity and potential collapse of the Euro become potentially viable outcomes. In the United States, President Obama’s approval rating is at an all time low. Congress approval rating is at 14% – FOURTEEN PERCENT! – also an all time low. Civil unrest has spread from oppressive dictatorial regimes in the Middle East and Africa to the developed world (see London riots). Corporate America is obviously feeling the effects of many of these issues as they affect all of us, directly or indirectly. Friends, we are living in a unique era. While world leaders collectively wrestle with the greatest economic challenges in the last 70 years, many corporations find themselves doing the same. Customers are voicing their opinions about companies they do business with, as constituents voice their displeasure about the poor job their leaders are doing on their behalf. The following incidents caught executives by surprise as specific cries against corporate actions rallied the hearts, minds, and activity of thousands in revolt against insensitive corporate interests. What’s perhaps most interesting is that these recent revolutions and crises, whether political or corporate, are being fueled and enabled by the reach and connectedness of internet based social networks. While Jeremiah and the team at The Altimeter Group once again published a quality open research report titled “Social Readiness: How Advanced Companies Prepare” , it is possible to miss some of the larger, more important underlying issues. 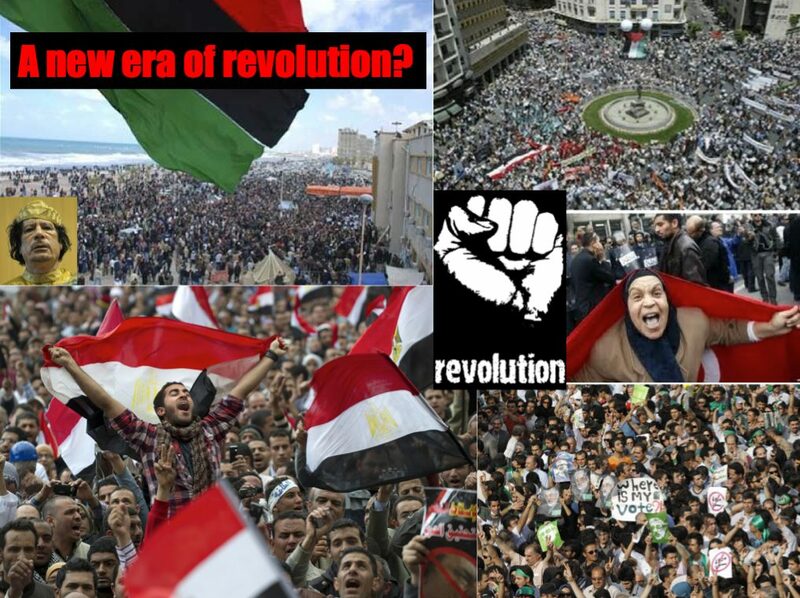 Surely, rapid uprisings and revolutions don’t just happen because someone tweets about it, or posts a YouTube video. It’s not the medium that really matters. It’s the ability for the message to spread, and for people to self-organize quickly – to out-think, out-flank, and out-number their oppressors or aggressors. Revolution happens because a latent frustration finds an outlet. It happens because enough people unite and take action around an idea of change. Connected by a common interest or frustration, the network effect takes place as people unite in a flash mob around a common goal. It happens because the thought of things staying the same becomes more fearful and oppressive than the uncertainty and risk associated with standing up and going a different direction. You see, I believe that there are tons of latent motivations out there that never turn into anything because the other two factors don’t exist. Social Networks and ubiquitous connectivity are providing the ability to actually do something once a trigger occurs. With latent motivations and now the ability to do something now in place, a trigger event becomes a spark that can quickly flame into a roaring fire. In a world that is increasingly connected, increasingly digital, and access to anything and anyone is available in real time, corporate leaders should be considering the following questions. The fabric of global society is transforming from a collection of lots of small, geographically connected groups to groups that are connected in a new geography that transcends previous space and time limitations. Much of the new global infrastructure has been laid and it will continue to become more pervasive and more powerful. People can now aggregate across boundaries, and organize beyond the constraints and management comforting silos. Al Quaeda and WikiLeaks quickly come to mind. In the same way, business units are self-organizing around the constraints of their IT departments. Guess what? Our prospects and customers now have the ability to do the same. So then the next question is, will your organization lead the next revolution in your marketplace, empowering and giving voice to the latent motivations of your customers, or will it become a victim of a more agile, more united group of customers who will self organize around their collective needs and jobs, leaving your outdated organization in their wake? If you are in Southern California or Arizona, please join me on September 21 and 22 as I lead discussions centered around this topic in a series of Executive Breakfasts sponsored by NICE. 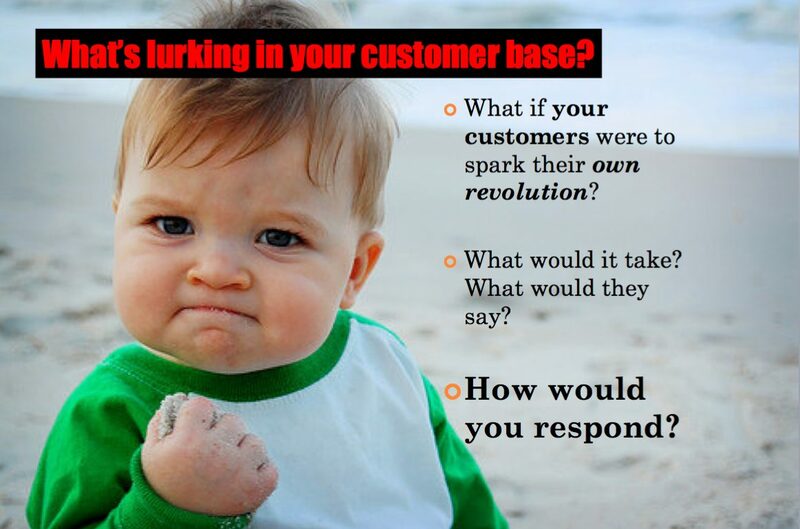 2 Responses to In an era of crisis & revolution, is your company the next target? I agree totaly with you, Brian. But I don’t think my company will be the next. One thing I learned before I became a bestselling author and long before Inc Magazine voted my company as one of the fastest growing companies is the seeds of revolution. Thanks for stopping by and for your comment. I’m curious how you utilized that knowledge for your benefit?